Despite the somewhat awkward motto, "Fly the Good Times," Kingfisher Airlines was extremely comfortable with decent food and televisions in the back of every seat. During the three hour flight to Goa I watched a talk show called (tellingly enough) "We The People" that hosted public debates in English about social problems in India. This particular episode dealt with the exploitation of child labor, a practice banned by law for children under 14. The debate brought up many fascinating issues such as whether it was morally responsible or reprehensible to bring in a child off the street for use as a servant. On the one hand it kept children off the streets, paid them a living wage, and insulated them from more pernicious forms of exploitation, while on the other hand forced them into a kind of indentured servitude subject to the whims and cruelty of their employers. The show also addressed funding for schools (or lack thereof) especially in the rural countryside where teachers often don't show up for work and the schools themselves lack chairs, desks, or writing instruments. The debate raged between government officials, social workers, audience members who believed household employment had to be in children's better interest, and ex-street urchins brought in to discuss (in Hindi) their own experiences of living and surviving on the street. Having been besieged by so many children in various states of dress, hygiene, and sickness shouting "Hallo Hallo" and "Excuse me, sir," their hands motioning wearily to their mouths, it was heart warming to hear people debating these issues so passionately. I found tears streaming down my cheeks as social workers stated the universally obvious sentiments that these children shouldn't be out begging for food, sold into prostitution, or working in the mines. They should be out playing happily in the sunshine, reading from books, and studying the world around them. A significant point in the conversation occurred when a middle-class Indian woman in attendance with her daughter stated proudly that she had taken in a little girl off the streets that had become like her own daughter. The girls played together, performed chores together, and received education sponsored by the family. There was some debate over this woman's ingenuousness until someone boldly asked whether the two little girls used the same toilet. The proud woman paused looking stunned and then abashedly argued that it was unreasonable to expect a girl off the street to use the same toilet as her own daughter. And herein lies the stigma of the destitute and untouchable. Indian society is trying desperately to accommodate these wretches into homes and schools and businesses, but only as far as the bathroom. I choked back tears watching this debate thinking that one of the most beautiful sites I'd seen in all of India were her children. Wearing schoolgirl uniforms crammed in the back of auto-rickshaws giggling and posing candidly for me, dancing joyfully to uptempo Hindi music, asking for American coins to contribute to their "coin collections," doing back flips outside my car, astride the backs of mothers rooting through gutter garbage alongside swine and cows, staring at me shyly across restaurants as if they had just run into their favorite Bollywood movie star. 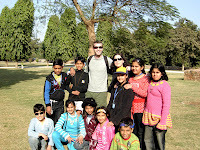 I couldn't help but think that these children are the key to India's future -- to its success, its beauty, its modernity. Those wide unassuming eyes and shining smiles somehow transcended their unbelievable social conditions while simultaneously highlighting them. At the top of our hotel in Jaipur, I remember looking at the construction site next door to find that whole families were camped in front of the skeletal building bathing their infant children. After the mothers cleaned the crying children from a bucket in the crisp morning air, they handing the children to the next oldest daughters to look after while the mothers themselves went to work with their husbands. I couldn't imagine this life just as they could never imagine mine, filled with long minutes soaked in ridiculously hot showers trying to sooth my aching sedentary muscles. I know that these perspectives are all relative and that I may very well lose this compassion I feel day to day in the laughable complexities of my modern life, but I will try desperately to hold on to what made these children so special. One could do worse than trying to spend a life in service trying to better these children's lives.